Mga Ka-Tropa! 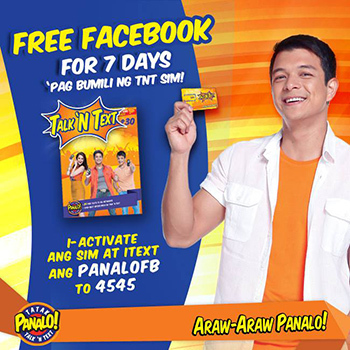 Get free unlimited access to Facebook with TNT PANALOFB Promo Get Unli FB for 1 week! Buy a new Talk ‘n Text simcard. It comes with 25 texts to TNT, Smart, Sun, Globe and TM subcribers and redeemable free Facebook. Just text PANALOFB and send to 4545. You can now enjoy unlimited FREE Facebook browsing for 7 days and stay connected with your friends and loved ones. Keep the fun going and keep posted with the latest happenings on your favorite social networking site. Go get a new TNT sim and activate it now! No worries as this promo is consumable to any type of Facebook-capable phone. Not yet a TNT subscriber? Get your TNT Sim now to enjoy the promo offer. Promo runs from August 29 – October 31, 2014. Please be informed that the Talk n’ Text unlimited UNLI FACEBOOK subscription cannot be stopped and must wait for the expiration date to be able to register again. For the latest Talk n’ Text call, text and surfing offers just visit us again. You can also check on Talk n’ Text Official and Unlipromo Facebook Page for the latest feeds. totoo po ba ito ? sino na nakatry ? sinubukan ko to hindi naman gumana..